Might be worth it for KOTR if nothing else. You fed Ryback to somebody else? Cruel story bro. Weighing up if it's worth feeding a maxed out Pro Rare Paige to an Ultra Rare Natalya? It bumps it up a lot and you'll get the super rare Paige soon enough. My Eva Marie was awesome until I leveled up to epic and everyone either has the Pro Paige or better Diva cards, my pro Paige is halfway leveled but I invested most of my time leveling up the other cards. Got a Pro Common Summer Rae that's maxed who still beats Rare or better level divas. Every once in a while I have to win those kind of diva matches with a stat boost, but not often. Came second in my last KotR and got a pair of Epic AJ Lee. Good stuff. Maxed out non-Pro she's 325/333/377/386. Her buff is SPD, CHA +25. My KOTR is still just Ultra Rare, don't seem to get anything above Super Rare from exhibitions even though I'm at epic though. 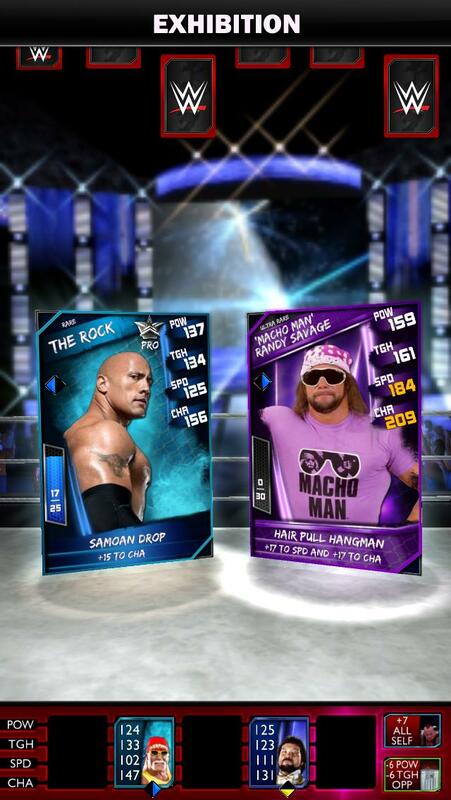 Just entered Ultra Rare zone in KOTR. Exhibition is Ultra Rare+. I jobbed to that Macho Man card once. Want it so bad. That was a brand new Macho card and/or the guy bought it, that was taken a couple of days ago when I was a day into it. I want to put money towards the game, but I'm waiting it out to earn my keep. I'd rather earn my keep, WWE gets enough of my money as it is. Hope you're maxing them out before combining them. Did not max out Alberto Del Rio or THE DEMON Kane because I didn't know any better. Cena and THE ANIMAL Batista I did. Pretty close to getting a second Super Rare WWE Paige too. I got a pair of SR Cesaro cards from winning the KOTR and combined them straight away, complete waste as a usable card but worked out ok for feeding to a better card later. If parkmania hadn't said I'd have been none the wiser. Well, I'm still pretty early in my setup, good heads up for when I get cards that matter. It makes a huge difference to the stats and when you sacrifice them to better cards down the line it levels them up quicker. so would feeding gray jobbers to greens and so on be a good practice? Let start from the bottom to build the greens just to feed to Super Rare main eventers? Am I the only one who has a compulsion to collect all the cards? I have a lot of rare cards that I am not doing anything with, just because I am waiting on getting a second one so I can get the pro version and work towards completing the "card catalogue". I've had all my usable cards in KOTR so I've hit my card limit a bunch of times and have took my best card and levelled it up to feed to whatever decent card I get from the tournament. When you move up a level feeding your previous top cards to the newer ones gives them a big jump in levels because they're maxed out but otherwise you're better just throwing 50 random jobber cards at it. Been doing that to make space, just setting the filter in my cards to combinable to fill up the catalogue. max them out before combining. 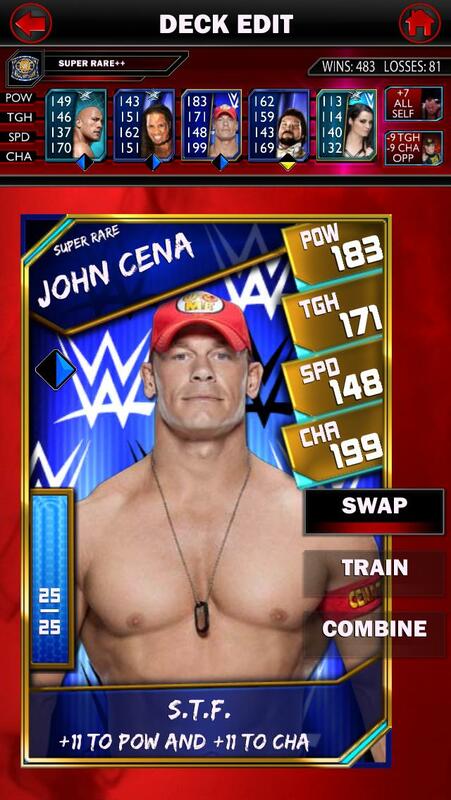 Do you see the John Cena Super Rare I have a few posts up? I maxed it out and I was wondering if I flubbed up just feeding everything to it. Like do other cards give more POW than CHA? I got a little careless and invested into the cards that won me the KOTR, very loyal to them, but I'm not above feeding them to eventual higher tier cards as I'm a heel when you strip all the gloss off the boss. Pretty sure it doesn't matter what cards you feed it. 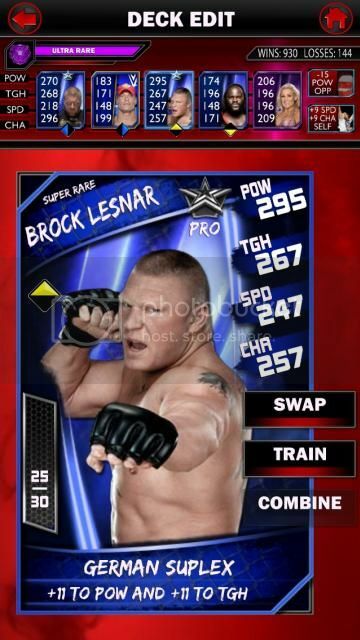 Card just give you XP to level up the card you are training, and the boosts you get at each level are set. The better the card you feed to the card you are leveling, the more XP it gives, leveling up faster. Ok, so I haven't wasted too many points then. I take this game very seriously as my primary mobile game. If I don't like where I'm at I'll bust the game out, plus I can play it while feeding my baby girl. I balance the baby and bottle, press on phone when I get the chance. How are you getting the photos? Screen capture? Does it? Had my maxed SR Cena go head to head with another one with the exact same stats. Seems a little unlikely that they get to that point by chance. yeah, just screen capturing with my phone and uploading it to imgur app. The exact same thing just happened for a second time. Less likely now.